For a definition of what a Feature is in the SubscriptionBridge system, please see the Glossary. The Reference Name is the Feature's name within the SubscriptionBridge Merchant Center. It is not shown to customers. It helps you quickly identify the Feature in the Merchant Center, so it does not need to be customer friendly, but rather useful to you and your staff (e.g. it could be an internal code that you and your staff are familiar with). SubscriptionBridge supports a multi-lingual front-end (the Merchant Center, instead, is only available in English at this time). Therefore, you can add Names & Descriptions for your Products in each of the languages that you have activated for your store. To do so, navigate to the Features page as described above, and then click on Names & Descriptions. 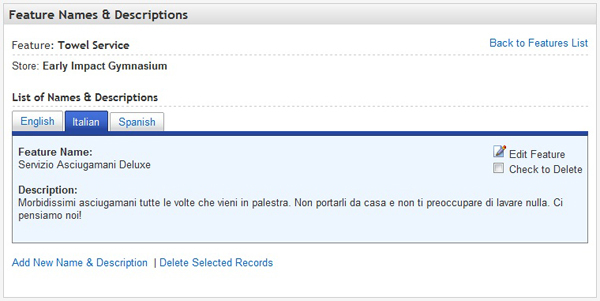 On the page that is displayed to you, click on the “Add New Name/Description” button to add a Feature Name and a Description in each of the languages that you have activated for the selected Store. For example, in the picture below the Store has English, Italian, and Spanish as the active languages, and therefore names and descriptions were entered for each of them. Enter a name for this Feature in the Language you have selected. This entry is shown to customers in the SubscriptionBridge front-end (e.g. in the SubscriptionBridge Shopping Cart, Customer Center and in e-mail Notifications). Enter a description for this Feature in the language you have selected. This entry is shown to customers in the SubscriptionBridge front-end. Under Packages, mouse over Features. 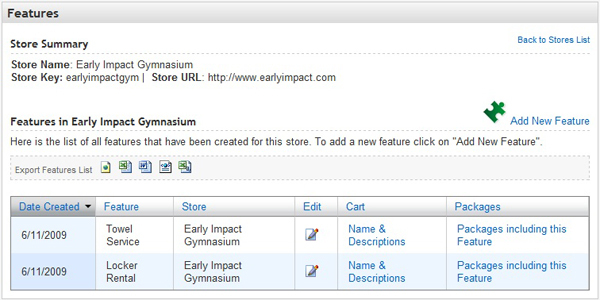 The system will display a preview of the Features you added to that store. Click on the link to load the list of Features. Click on Names & Descriptions to view and edit the feature name and descriptions used in the SubscriptionBridge front-end pages (SubscriptionBridge Shopping Cart and Customer Center) and in e-mail notifications sent by the system. Mouse over the link to preview all names and descriptions that have been entered for a certain feature. list of packages that use the selected feature.